Herbicides (US: /ˈɜːrbɪsaɪdz/, UK: /ˈhɜːr-/), also commonly known as weedkillers, are chemical substances used to control unwanted plants. Selective herbicides control specific weed species, while leaving the desired crop relatively unharmed, while non-selective herbicides (sometimes called total weedkillers in commercial products) can be used to clear waste ground, industrial and construction sites, railways and railway embankments as they kill all plant material with which they come into contact. Apart from selective/non-selective, other important distinctions include persistence (also known as residual action: how long the product stays in place and remains active), means of uptake (whether it is absorbed by above-ground foliage only, through the roots, or by other means), and mechanism of action (how it works). Historically, products such as common salt and other metal salts were used as herbicides, however these have gradually fallen out of favor and in some countries a number of these are banned due to their persistence in soil, and toxicity and groundwater contamination concerns. Herbicides have also been used in warfare and conflict. Modern herbicides are often synthetic mimics of natural plant hormones which interfere with growth of the target plants. The term organic herbicide has come to mean herbicides intended for organic farming. Some plants also produce their own natural herbicides, such as the genus Juglans (walnuts), or the tree of heaven; such action of natural herbicides, and other related chemical interactions, is called allelopathy. Due to herbicide resistance - a major concern in agriculture - a number of products combine herbicides with different means of action. Integrated pest management may use herbicides alongside other pest control methods. Although research into chemical herbicides began in the early 20th century, the first major breakthrough was the result of research conducted in both the UK and the US during the Second World War into the potential use of herbicides in war. The first modern herbicide, 2,4-D, was first discovered and synthesized by W. G. Templeman at Imperial Chemical Industries. In 1940, he showed that "Growth substances applied appropriately would kill certain broad-leaved weeds in cereals without harming the crops." By 1941, his team succeeded in synthesizing the chemical. In the same year, Pokorny in the US achieved this as well. Selective herbicides control or suppress certain plants without affecting the growth of other plants species. Selectivity may be due to translocation, differential absorption, physical (morphological) or physiological differences between plant species. 2,4-D, mecoprop, dicamba control many broadleaf weeds but remain ineffective against turfgrasses. Non-selective herbicides are not specific in acting against certain plant species and control all plant material with which they come into contact. They are used to clear industrial sites, waste ground, railways and railway embankments. Paraquat, glufosinate, glyphosate are non-selective herbicides. Preplant: Preplant herbicides are nonselective herbicides applied to soil before planting. Some preplant herbicides may be mechanically incorporated into the soil. The objective for incorporation is to prevent dissipation through photodecomposition and/or volatility. The herbicides kill weeds as they grow through the herbicide treated zone. Volatile herbicides have to be incorporated into the soil before planting the pasture. Agricultural crops grown in soil treated with a preplant herbicide include tomatoes, corn, soybeans and strawberries. Soil fumigants like metam-sodium and dazomet are in use as preplant herbicides. Postemergence: These herbicides are applied after weed seedlings have emerged through the soil surface. They can be foliar or root absorbed, selective or nonselective, contact or systemic. Application of these herbicides is avoided during rain because the problem of being washed off to the soil makes it ineffective. 2,4-D is a selective, systemic, foliar absorbed postemergence herbicide. Herbicides are often classified according to their site of action, because as a general rule, herbicides within the same site of action class will produce similar symptoms on susceptible plants. Classification based on site of action of herbicide is comparatively better as herbicide resistance management can be handled more properly and effectively. Classification by mechanism of action (MOA) indicates the first enzyme, protein, or biochemical step affected in the plant following application. ALS inhibitors: the acetolactate synthase (ALS) enzyme (also known as acetohydroxyacid synthase, or AHAS) is the first step in the synthesis of the branched-chain amino acids (valine, leucine, and isoleucine). These herbicides slowly starve affected plants of these amino acids, which eventually leads to inhibition of DNA synthesis. They affect grasses and dicots alike. The ALS inhibitor family includes various sulfonylureas (SUs) (such as Flazasulfuron and Metsulfuron-methyl), imidazolinones (IMIs), triazolopyrimidines (TPs), pyrimidinyl oxybenzoates (POBs), and sulfonylamino carbonyl triazolinones (SCTs). The ALS biological pathway exists only in plants and not animals, thus making the ALS-inhibitors among the safest herbicides. Photosystem II inhibitors reduce electron flow from water to NADP+ at the photochemical step in photosynthesis. They bind to the Qb site on the D1 protein, and prevent quinone from binding to this site. Therefore, this group of compounds causes electrons to accumulate on chlorophyll molecules. As a consequence, oxidation reactions in excess of those normally tolerated by the cell occur, and the plant dies. The triazine herbicides (including atrazine) and urea derivatives (diuron) are photosystem II inhibitors. Photosystem I inhibitors steal electrons from the normal pathway through FeS to Fdx to NADP+ leading to direct discharge of electrons on oxygen. As a result, reactive oxygen species are produced and oxidation reactions in excess of those normally tolerated by the cell occur, leading to plant death. Bipyridinium herbicides (such as diquat and paraquat) inhibit the FeS to Fdx step of that chain, while diphenyl ether herbicides (such as nitrofen, nitrofluorfen, and acifluorfen) inhibit the Fdx to NADP+ step. One of the most important methods for preventing, delaying, or managing resistance is to reduce the reliance on a single herbicide mode of action. To do this, farmers must know the mode of action for the herbicides they intend to use, but the relatively complex nature of plant biochemistry makes this difficult to determine. Attempts were made to simplify the understanding of herbicide mode of action by developing a classification system that grouped herbicides by mode of action. Eventually the Herbicide Resistance Action Committee (HRAC) and the Weed Science Society of America (WSSA) developed a classification system. The WSSA and HRAC systems differ in the group designation. Groups in the WSSA and the HRAC systems are designated by numbers and letters, respectively. The goal for adding the “Group” classification and mode of action to the herbicide product label is to provide a simple and practical approach to deliver the information to users. This information will make it easier to develop educational material that is consistent and effective. It should increase user’s awareness of herbicide mode of action and provide more accurate recommendations for resistance management. Another goal is to make it easier for users to keep records on which herbicide mode of actions are being used on a particular field from year to year. A further method of herbicide application developed around 2010, involves ridding the soil of its active weed seed bank rather than just killing the weed. This can successfully treat annual plants but not perennials. Researchers at the Agricultural Research Service found that the application of herbicides to fields late in the weeds' growing season greatly reduces their seed production, and therefore fewer weeds will return the following season. Because most weeds are annuals, their seeds will only survive in soil for a year or two, so this method will be able to destroy such weeds after a few years of herbicide application. 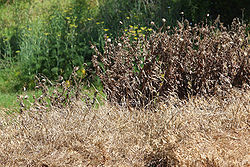 Weed-wiping may also be used, where a wick wetted with herbicide is suspended from a boom and dragged or rolled across the tops of the taller weed plants. This allows treatment of taller grassland weeds by direct contact without affecting related but desirable shorter plants in the grassland sward beneath. The method has the benefit of avoiding spray drift. In Wales, a scheme offering free weed-wiper hire was launched in 2015 in an effort to reduce the levels of MCPA in water courses. Herbicides have widely variable toxicity in addition to acute toxicity arising from ingestion of a significant quantity rapidly, and chronic toxicity arising from environmental and occupational exposure over long periods. Much public suspicion of herbicides revolves around a confusion between valid statements of acute toxicity as opposed to equally valid statements of lack of chronic toxicity at the recommended levels of usage. For instance, while glyphosate formulations with tallowamine adjuvants are acutely toxic, their use was found to be uncorrelated with any health issues like cancer in a massive US Department of Health study on 90,000 members of farmer families for over a period of 23 years. That is, the study shows lack of chronic toxicity, but cannot question the herbicide's acute toxicity. Some herbicides cause a range of health effects ranging from skin rashes to death. The pathway of attack can arise from intentional or unintentional direct consumption, improper application resulting in the herbicide coming into direct contact with people or wildlife, inhalation of aerial sprays, or food consumption prior to the labelled preharvest interval. Under some conditions, certain herbicides can be transported via leaching or surface runoff to contaminate groundwater or distant surface water sources. Generally, the conditions that promote herbicide transport include intense storm events (particularly shortly after application) and soils with limited capacity to adsorb or retain the herbicides. Herbicide properties that increase likelihood of transport include persistence (resistance to degradation) and high water solubility. Worldwide experience has been that farmers tend to do little to prevent herbicide resistance developing, and only take action when it is a problem on their own farm or neighbor’s. Careful observation is important so that any reduction in herbicide efficacy can be detected. This may indicate evolving resistance. It is vital that resistance is detected at an early stage as if it becomes an acute, whole-farm problem, options are more limited and greater expense is almost inevitable. Table 1 lists factors which enable the risk of resistance to be assessed. An essential pre-requisite for confirmation of resistance is a good diagnostic test. Ideally this should be rapid, accurate, cheap and accessible. Many diagnostic tests have been developed, including glasshouse pot assays, petri dish assays and chlorophyll fluorescence. A key component of such tests is that the response of the suspect population to a herbicide can be compared with that of known susceptible and resistant standards under controlled conditions. Most cases of herbicide resistance are a consequence of the repeated use of herbicides, often in association with crop monoculture and reduced cultivation practices. It is necessary, therefore, to modify these practices in order to prevent or delay the onset of resistance or to control existing resistant populations. A key objective should be the reduction in selection pressure. An integrated weed management (IWM) approach is required, in which as many tactics as possible are used to combat weeds. In this way, less reliance is placed on herbicides and so selection pressure should be reduced. Herbicide resistance became a critical problem in Australian agriculture, after many Australian sheep farmers began to exclusively grow wheat in their pastures in the 1970s. Introduced varieties of ryegrass, while good for grazing sheep, compete intensely with wheat. Ryegrasses produce so many seeds that, if left unchecked, they can completely choke a field. Herbicides provided excellent control, while reducing soil disrupting because of less need to plough. Within little more than a decade, ryegrass and other weeds began to develop resistance. In response Australian farmers changed methods. By 1983, patches of ryegrass had become immune to Hoegrass, a family of herbicides that inhibit an enzyme called acetyl coenzyme A carboxylase. Recently, the term "organic" has come to imply products used in organic farming. Under this definition, an organic herbicide is one that can be used in a farming enterprise that has been classified as organic. Depending on the application, they may be less effective than synthetic herbicides and are generally used along with cultural and mechanical weed control practices. Steam has been applied commercially, but is now considered uneconomical and inadequate. It controls surface growth but not underground growth and so respraying to treat regrowth of perennials is needed. 2,4,5-Trichlorophenoxyacetic acid (2,4,5-T) was a widely used broadleaf herbicide until being phased out starting in the late 1970s. While 2,4,5-T itself is of only moderate toxicity, the manufacturing process for 2,4,5-T contaminates this chemical with trace amounts of 2,3,7,8-tetrachlorodibenzo-p-dioxin (TCDD). TCDD is extremely toxic to humans. With proper temperature control during production of 2,4,5-T, TCDD levels can be held to about .005 ppm. Before the TCDD risk was well understood, early production facilities lacked proper temperature controls. Individual batches tested later were found to have as much as 60 ppm of TCDD. 2,4,5-T was withdrawn from use in the USA in 1983, at a time of heightened public sensitivity about chemical hazards in the environment. Public concern about dioxins was high, and production and use of other (non-herbicide) chemicals potentially containing TCDD contamination was also withdrawn. These included pentachlorophenol (a wood preservative) and PCBs (mainly used as stabilizing agents in transformer oil). Some feel[who?] that the 2,4,5-T withdrawal was not based on sound science. 2,4,5-T has since largely been replaced by dicamba and triclopyr. 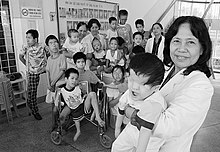 Agent Orange was a herbicide blend used by the British military during the Malayan Emergency and the U.S. military during the Vietnam War between January 1965 and April 1970 as a defoliant. It was a 50/50 mixture of the n-butyl esters of 2,4,5-T and 2,4-D. Because of TCDD contamination in the 2,4,5-T component, it has been blamed for serious illnesses in many people who were exposed to it. ^ a b c d e f g h Vats, S. (2015). "Herbicides: history, classification and genetic manipulation of plants for herbicide resistance". In Lichtfouse, E. (ed.). Sustainable Agriculture Reviews 15. Springer International Publishing. pp. 153–192. ^ Moran GR (Jan 2005). "4-Hydroxyphenylpyruvate dioxygenase" (PDF). Arch Biochem Biophys. 433 (1): 117–28. doi:10.1016/j.abb.2004.08.015. PMID 15581571. Archived from the original (PDF) on 2014-03-03. ^ Van Almsick, A. (2009). "New HPPD-Inhibitors – A Proven Mode of Action as a New Hope to Solve Current Weed Problems". Outlooks on Pest Management. 20: 27–30. doi:10.1564/20feb09. ^ Lock, E. A.; Ellis, M. K.; Gaskin, P; Robinson, M; Auton, T. R.; Provan, W. M.; Smith, L. L.; Prisbylla, M. P.; Mutter, L. C.; Lee, D. L. (1998). "From toxicological problem to therapeutic use: The discovery of the mode of action of 2-(2-nitro-4-trifluoromethylbenzoyl)-1,3-cyclohexanedione (NTBC), its toxicology and development as a drug". Journal of Inherited Metabolic Disease. 21 (5): 498–506. doi:10.1023/A:1005458703363. PMID 9728330. ^ a b c Shaner, D. L.; Leonard, P. (2001). "Regulatory aspects of resistance management for herbicides and other crop protection products". In Powles, S. B.; Shaner, D. L. (eds.). Herbicide Resistance and World Grains. CRC Press, Boca Raton, FL. pp. 279–294. ISBN 9781420039085. ^ a b c d Forouzesh, Abed; Zand, Eskandar; Soufizadeh, Saeid; Samadi Foroushani, Sadegh (2015). "Classification of herbicides according to chemical family for weed resistance management strategies–an update". Weed Research. 55 (4): 334–358. doi:10.1111/wre.12153. ^ a b Beckie, H. J.; Harker, L. M.; Hall, S. I.; et al. (2006). "A decade of herbicide-resistant crops in Canada". Canadian Journal of Plant Science. 86 (4): 1243–1264. doi:10.4141/P05-193. ^ Andreotti, Gabriella; Koutros, Stella; Hofmann, Jonathan N; Sandler, Dale P; Lubin, Jay H; Lynch, Charles F; Lerro, Catherine C; De Roos, Anneclaire J; Parks, Christine G; Alavanja, Michael C; Silverman, Debra T; Beane Freeman, Laura E (2018). "Glyphosate Use and Cancer Incidence in the Agricultural Health Study". JNCI Journal of the National Cancer Institute. 110 (5): 509–516. doi:10.1093/jnci/djx233. PMID 29136183. ^ Kogevinas, M; Becher, H; Benn, T; et al. (1997). "Cancer mortality in workers exposed to phenoxy herbicides, chlorophenols, and dioxins. An expanded and updated international cohort study". American Journal of Epidemiology. 145 (12): 1061–75. doi:10.1093/oxfordjournals.aje.a009069. PMID 9199536. ^ Kettles, MK; Browning, SR; Prince, TS; Horstman, SW (1997). "Triazine herbicide exposure and breast cancer incidence: An ecologic study of Kentucky counties". Environmental Health Perspectives. 105 (11): 1222–7. doi:10.1289/ehp.971051222. PMC 1470339. PMID 9370519. ^ Talbot, AR; Shiaw, MH; Huang, JS; Yang, SF; Goo, TS; Wang, SH; Chen, CL; Sanford, TR (1991). "Acute poisoning with a glyphosate-surfactant herbicide ('Roundup'): A review of 93 cases". Human & Experimental Toxicology. 10 (1): 1–8. doi:10.1177/096032719101000101. PMID 1673618. ^ Reuber, MD (1981). "Carcinogenicity of Picloram". Journal of Toxicology and Environmental Health. 7 (2): 207–222. doi:10.1080/15287398109529973. PMID 7014921. ^ Gorell, JM; Johnson, CC; Rybicki, BA; Peterson, EL; Richardson, RJ (1998). "The risk of Parkinson's disease with exposure to pesticides, farming, well water, and rural living". Neurology. 50 (5): 1346–50. doi:10.1212/WNL.50.5.1346. PMID 9595985. ^ Dinis-Oliveira, R.J.; Remião, F.; Carmo, H.; Duarte, J.A. ; Navarro, A. Sánchez; Bastos, M.L. ; Carvalho, F. (2006). "Paraquat exposure as an etiological factor of Parkinson's disease". NeuroToxicology. 27 (6): 1110–22. doi:10.1016/j.neuro.2006.05.012. PMID 16815551. ^ Blus, Lawrence J.; Henny, Charles J. (1997). "Field Studies on Pesticides and Birds: Unexpected and Unique Relations". Ecological Applications. 7 (4): 1125–1132. doi:10.1890/1051-0761(1997)007[1125:FSOPAB]2.0.CO;2. ^ MacKinnon, D. S.; Freedman, B. (1993). "Effects of Silvicultural Use of the Herbicide Glyphosate on Breeding Birds of Regenerating Clearcuts in Nova Scotia, Canada". Journal of Applied Ecology. 30 (3): 395–406. doi:10.2307/2404181. JSTOR 2404181. ^ Newton, Ian (2004). "The recent declines of farmland bird populations in Britain: An appraisal of causal factors and conservation actions". Ibis. 146 (4): 579–600. doi:10.1111/j.1474-919X.2004.00375.x. ^ Hayes, T. B.; Collins, A.; Lee, M.; Mendoza, M.; Noriega, N.; Stuart, A. A.; Vonk, A. (2002). "Hermaphroditic, demasculinized frogs after exposure to the herbicide atrazine at low ecologically relevant doses". Proceedings of the National Academy of Sciences. 99 (8): 5476–80. Bibcode:2002PNAS...99.5476H. doi:10.1073/pnas.082121499. PMC 122794. PMID 11960004. ^ Ibrahim MA, Bond GG, Burke TA, Cole P, Dost FN, Enterline PE, Gough M, Greenberg RS, Halperin WE, McConnell E, et al. (1991). "Weight of the evidence on the human carcinogenicity of 2,4-D". Environ Health Perspect. 96: 213–222. doi:10.1289/ehp.9196213. PMC 1568222. PMID 1820267. ^ Howard I. Morrison; Kathryn Wilkins; Robert Semenciw; Yang Mao; Don Wigle (1992). "Herbicides and Cancer". Journal of the National Cancer Institute. 84 (24): 1866–1874. doi:10.1093/jnci/84.24.1866. PMID 1460670. ^ a b c d Service, R. F. (2013). "What Happens when Weed Killers Stop Killing?". Science. 341 (6152): 1329. doi:10.1126/science.341.6152.1329. PMID 24052282. ^ Powles, S.B. ; Yu, Q. (2010). "Evolution in action: plants resistant to herbicides". Annual Review of Plant Biology. 61: 317–347. doi:10.1146/annurev-arplant-042809-112119. PMID 20192743. ^ Alberto, Diana; Serra, Anne-Antonella; Sulmon, Cécile; Gouesbet, Gwenola; Couée, Ivan (2016). "Herbicide-related signaling in plants reveals novel insights for herbicide use strategies, environmental risk assessment and global change assessment challenges". Science of the Total Environment. 569-570: 1618–1628. Bibcode:2016ScTEn.569.1618A. doi:10.1016/j.scitotenv.2016.06.064. PMID 27318518. ^ a b c d e Moss, S. R. (2002). "Herbicide-Resistant Weeds". In Naylor,, R. E. L. (ed.). Weed management handbook (9th ed.). Blackwell Science Ltd. pp. 225–252. ISBN 978-0-632-05732-0. ^ a b c Stokstad, E. (2013). "The War Against Weeds Down Under". Science. 341 (6147): 734–736. doi:10.1126/science.341.6147.734. PMID 23950526. ^ McDade, Melissa C.; Christians, Nick E. (2009). "Corn gluten meal—a natural preemergence herbicide: Effect on vegetable seedling survival and weed cover". American Journal of Alternative Agriculture. 15 (4): 189. doi:10.1017/S0889189300008778. ^ Kolberg, Robert L.; Lori J. Wiles (2002). "Effect of Steam Application on Cropland Weeds1". Weed Technology. 16: 43–49. doi:10.1614/0890-037X(2002)016[0043:EOSAOC]2.0.CO;2.